HELL no you aren’t gonna pry this out of my cold dead hands! Damn that’s some good wine! But alas, there is a preponderance of rating scales out there and the most popular is the 100 point scale favored by overblown wine critics every where. Wine shopes are filled with wines that either haven’t been deemed as worthy enough to rate, or those that didnt’ score the coveted 90+ points required to sell out quickly, thereby ensuring the futures of the winemakers college educations. For this Twitter Taste Live, on Saturday December 13th, we are being hosted by David Honig of The 89 Project. The goal of the project is to expose wines that might otherwise flounder in the dusty bottom shelves of BevMo. Those wines that are perfectly drinkable, if not enjoyable, and are still inexpensive enough to be worthly of your Carbonara. 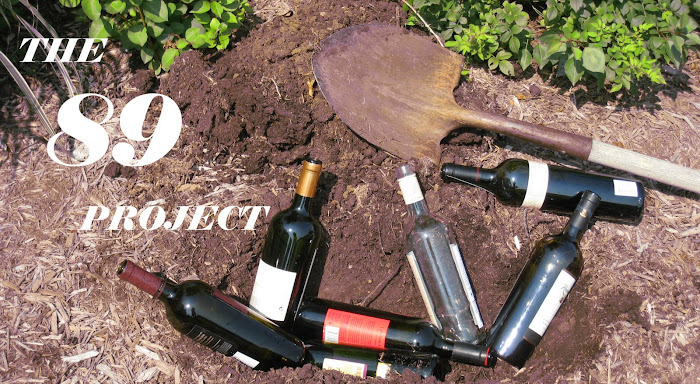 The 89 Project seeks to join bloggers, wine lovers and reviewers to cross-post their thoguhts on these 89 point wines. For the first time, we are being sent our Twitter Taste Live wines BLIND! That’s right folks. We aren’t going to knwo what they are. It’s a SURPRISE! This will elminate any posturing over lables or regions that might be less than stellar in our minds eyes. The project participants will all sit down and taste these wines at the same time, and tweet about them – LIVE. I for one am looking forward to this event and am excited to share our opinions with the wine commuinity! If you would like to participate, please go to Twitter Taste Live and sign up. If you’re not already a member, please take a moment to join. It’s free, and it’s fun! Just tell them I sent you and then you can RSVP to upcoming events. Click HERE to RSVP or to join Twitter Taste Live! this is in response to rating on wines and who rates them. Rating a wine is all part of a marketing stratigy and how much marketing $ they spend. Alot of time the more $ spent the wine will get a higher rating. Also palates are different and certainly the person rating the wine has a very high sense of taste as aposed to mine. Just because that person loves it for what ever charcatoristics it has doesn't mean I will love it as well. Try this: go into your favorite wine shop and ask them what non rated wines could they recomend. /be sure to give them your likes and dis-likes by using wine descriptors. More than likely they will take you to their secret stash. It's a good way to build a rapport with them , you w3ill continue to be exposed to some amazing wines.